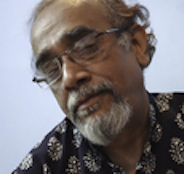 Aditya Basak was born in 1953 in Kolkata. In 1977 he received his degree in Fine Arts from Government College of Art and Craft, Kolkata. In 1999 he had a solo exhibition at Admin One Gallery, New York. In 1999 and 2002 he exhibited solo at Birla Academy of Art and Culture, Kolkata. In 2000, 2003 and 2008 he had solo exhibitions in New Delhi, Chennai, Kolkata and at Jehangir Art Gallery, Mumbai. In 1989 he took part in ‘The Bombay Art Society Centenary Invitees Show’ held at Jehangir Art Gallery, Mumbai. In 1990 he participated in group shows in Mumbai, Kolkata and New Delhi. From 1996 - 1999 he participated in group shows at Nehru Centre, Mumbai. In 1997 and 1998 he exhibited in group shows ‘Celebrating 50 years of India’s Independence’ in Toronto and Singapore. In 1998 and 1999 he took part in a group exhibitions in New Delhi, Hong Kong and Dhaka. In 2001 and 2002 he participated in group shows at NGMA, Mumbai and at CIMA, Kolkata. In 2005, 2007, 2009, 2010 and 2011 he took part in group shows in Mumbai, Bangalore, Kolkata, Munich and at Aicon Gallery, New York. In 1975 he won a scholarship to study at the Government College of Art and Crafts, Kolkata. In 1986 he received Senior Fellowship (Visual Art) from the Ministry of Human Resources Development, Government of India and he won the State Government Award in Kolkata and a National Award in New Delhi.